Thank You For Nominating My Blog - Please Vote! This month was big on activities outside the home, so our indoor academics were a little lighter than last month. It seems that the tide of indoor and outdoor activities flows regularly. Some months we have little on and spend a good deal of our time on academic work and other months it is the complete opposite. I am firm believer in all activities having equal importance, there is after all learning to be enjoyed in everything we do. So I am rarely concerned when our out of doors activities seem to take over our desk work. Just another reason why homeschooling is a wonderful way of life. Fitzroy Word Skills 4, completed the first lesson. Finally these lessons seem to be digging a little deeper (we've been breezing through them for a while now). The readers are now relatively easy for B but we are continuing on with the lessons as they cover much more than just the reader. This lesson worked on a-e sounds, ou sounds, sight words, opposites, nouns, literal comprehension with both fill in the gap type questions and more open questions for discussion, oral english discussion questions, Idioms and he had to design his own Birthday Party Invitation. We've started including some of the Developing Literacy Activity Books by Blake Education into our day. A brief description for this particular book from their website: develops children's understanding of sound-spelling relationships. It includes activities which focus on phonics, spelling, word recognition and vocabulary. You will find extension activities on each page which reinforce and develop what the children have learned. We did not use this cover to cover, only where we saw a need or we knew that the activity would benefit. 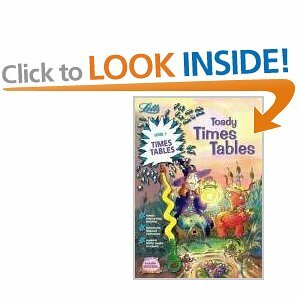 The Word Activities book contains a few games also which we have enjoyed. 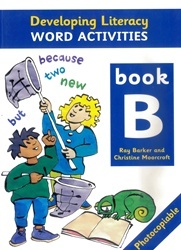 B has now completed this book and will move to some of the activities in Book C.
Developing Literacy Sentence Activites Book B: helps children to develop grammatical awareness in order to make sense of text, skills in prediction words and an understanding of elements of grammar introduced in Book A. It also helps to develop an appreciation of the appropriate pace and expression with which a sentence should be read, an understanding of the effects of changing word-order in a sentence, people's titles, family names, titles, headings and captions, the demarcation of sentences using full stops, questions and the use of the question mark, when to use capital letters to begin names other than those of people. This book provides as well an understanding of different kinds of sentences and their structure, and the roles of different kinds of words. (from their website) Once again we've only used parts of this book. We started Enid Blyton's Story Time Book. Computer Classroom At Home Software - Spelling after having access to Time 4 Learning for a month it has prompted us to pull out some of software that has been sitting for quite some times. He is progressing nicely with Handwriting Without Tears Cursive and completed pages 16 - 21. 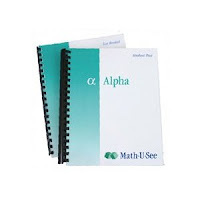 You might remember me mentioning that we had decided to go back and pull Math u See off our shelves. Now we could have easily skipped a level but we chose to finish off the Alpha level simply because I like the way the concepts are taught and if you don't have the basics down pat then everything else is generally that much more difficult. So whilst B is breezing through Alpha, his number facts recall is increasing in speed considerably. He completed lessons 15 - 17, the unit test for lessons 1 - 17 and lessons 18 - 23. B has also been working on the Math U See online timed drills. Twelve months ago he disliked anything that was timed but has been enjoying seeing is time score come down, this has also really helped his fact recall speed. Qld Targeting Maths completed end of term Revisions work and finished off 5 Evan Moor Daily Word Problems. We were given a copy of Letts Toady Times Tables Level 1, a fun, colourful, sticker book introduction to Times Tables. Since this is exactly where he is at with his Qld Targeting Maths work we decided that this might be fun. He worked on, what they call the 'Tricky Twos'. On camp everyone had the opportunity to try their hand at pond skimming in the Creek to see what Critters they could find. Several little bugs and beetles were scooped up, as well as quite a few guppies. One of the Instructor lead, camp activities was to follow a Waterway from a rainfall catchment area, along the river and out to sea. The group followed along the story with their maps in hand, as the Instructor lead them through the journey of what our water experiences as it travels down the rivers and makes its way out to sea. To begin she had B scoop a small clear container of water from the dam where this activity took place (the rainfall catchment area) and there the journey began, past parks, through residential areas, so on and so on, finally making its way to the ocean. As each area of the river was passed the children discussed the types of pollutants that could possibly enter the waterway, as they did this one of them added these pollutants to their water way (the small container of water). By the end of the waters journey it was quite icky and horrible, terribly polluted. Discussions then lead into how our ocean life handles this pollution and what it would be like to be a fish swimming in the polluted waters. Many children came up with various ways in which they could help our water and little fishy friends. One of our very lovely Grandmothers has offered to teach small groups of Spanish. B enjoyed three trial lessons this month and has loved it. He seems to have a knack for picking up the pronounciation quite easily and his dad was very impressed with him rattling off what he had learned - Hello, My Name Is, What Is Your Name, I am x Years Old, A few colours and a couple of other random words. We are very lucky to have a fluent speaker working with the kids. We have started a brief Aboriginal Unit this month (post coming) and also experienced two very neat Aboriginal Experiences. The first was to a local cultural centre where the children spent the day learning more about the Aboriginal way of life (post coming). The second was a shorter experience, whereby the presenter came to us, but was fabulously hands on and interactive. During one of Little C's Playdough exploration times B decided to join him and sculpted himself a pet Playdough Pet Dinosaur. His drawing is still advancing in leaps and bounds as can be seen from his recent notebook pages in this History Unit. He also completed Mosaic Stickers Pirate kit that we had here in the cupboard. I'm not sure why the poor old craft kit gets such a bad knock. Do they really stifle ones creativity? Not in this house they don't anyway. I suppose if a child had limited experience with various art materials and mediums and was utilising craft kits (cookie cutter crafts) and colouring in books as their staple art and craft experience then I am sure that their creativity would be limited. However if kits and the like are only used as a supplement, a from time to time activity (as they are here in our house) then really I see absolutely no harm in them. All things in moderation is one of my motto's! They are fun, generally quick to complete. Easy to put together and generally give fairly good results. Often some of the kits we have had on hand have sparked many a creative adventure. I ask for craft kits as gifts as I would much prefer the children received these than some plastic toy that will either end up broken or left in the cupboard after a week or two of play. B has been quite keen on learning to type of late so he tried out BBC's Dance Mat Typing and I dug out a Sponge Bob Squarepants Typing disc we have here. This was a sparodic exercise though as we were out and about so much this month. I do know that I will continue to steer him to Dance Mat Typing over the Sponge Bob program, which offers very little in the way of 'exactly how to type' and much more game type activities. As always he spent a great deal of his spare time working on Lego creations. His desire for new Lego kits seems to be slowing down (thank goodness as we are being over run by them) and he now seems content to just build his own things. However I was most impressed with his Razor Scooter, with fully working wheels, moveable handle (the whole wheel piece swivels like on a scooter) and a working brake. And here I struggle to build a simple bridge design lol!!! And we can't forget that my firstborn baby has now entered his last year of single digits. He celebrated his 9th Birthday. We have another busy month ahead of us and will certainly be ready for some down time come Christmas. What a great month! That little play dough pet dinosaur is adorable! I think craft kits are great! We don't use them often, just because we have lots of open-ended crafting materials and my children are too young for many of them, but my kids love doing them from time to time. Whoa, that Lego scooter is awesome! B is a true engineer.